What is the best curriculum you’ve probably never heard of but should have? The Logic of English!! We were beyond blessed to have been chosen for this review of their Essentials Program and their Ipad Phonograms App. The Logic of English® Essentials curriculum includes 40 lessons to introduce the 74 Basic Phonograms and 30 Spelling Rules. While the spelling list includes 480 of the most frequently used words, students learn thousands of additional words with the lessons as they learn how to write compound words and add prefixes and suffixes to form derivatives. Before I begin my review, I need to give you a little background. I, in my infinite homeschooling mama wisdom (cough-cough), decided that when I started homeschooling Abbey when she was a kindergartner, I would teach her to read via the sight word method. Despite years of struggling and pulling my hair out to get her to learn this method, I still thought I was doing what was best for her in the long run. Despite the fact that she didn’t read well or recognize words well until she was seven years old, I still thought I was doing what was best. And while her reading ability has improved almost three grade levels in the last year alone, she is still an atrocious speller because she does not have a clue which letter combinations make up the sounds she hears in words. If the word she is trying to spell is not one she has memorized, she will consistently misspell it. I am not proud of the fact that I taught her incorrectly, and I regret it with everything in me. However, God, in His infinite grace, has allowed me to discover and review the Essentials Program from Logic of English: A Systematic Approach to Reading, Spelling and Writing. Author Denise Eide has shown us the care and keeping of a phonics, reading, spelling, writing and grammar program, and has neatly packaged it for homeschool and traditional classroom use. Please click HERE to learn more about the recommended, strongly recommended, and optional items for the Essentials Program. The Essentials Program is recommended for ages 7 to adult, and especially for struggling readers and/or struggling spellers (as my daughter is). I followed the instructions in the guide to the letter, and took the time necessary to prepare for teaching this course. I studied how important phonemic and kinesthetic awareness of sounds are. I learned how students progress from phonics to “gluing” the sounds together to make words, and how important it is for them to "un-glue" the words as well. Additionally, I learned the importance of cursive and how much easier it really is for the student to use. Was all this preparation time-consuming? Yes. Is my child worth it? Yes! We start each new lesson with the Phonograms App on the Ipad. 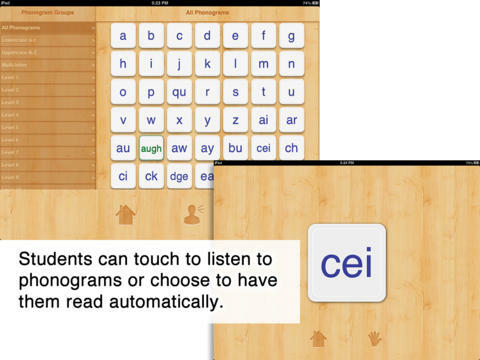 This app allows the student to see the phonograms and hear them spoken. It quizzes the student on each level of new phonograms (corresponding with the lessons in the workbook.) A review of past lesson phonograms are also included. 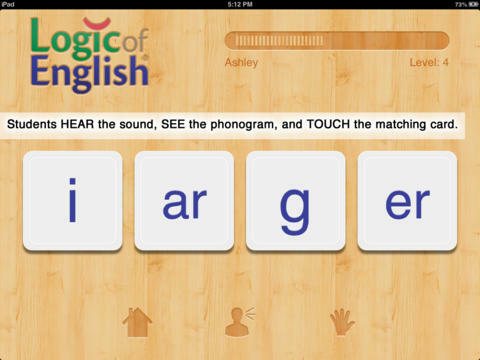 The app ‘speaks’ the sound that each phonogram can make, and the student must press the correct letter(s). Incorrect answers are met with a buzz, and correct answers are meet with a ding. After each level is completed, the student is taken to the review screen and if they have mastered a phonogram by getting it correct five or more times, it is marked as “mastered.” Abbey loved this overview and the progress she was making. While the app is a wonderful supplement and a great deal at only $2.99, it is NOT necessary to be successful at this stage of the lesson. You, as the teacher, may just say the sounds aloud for the student and have them write them in their notebook, where a space is provided. We then play a game as directed in the teacher’s manual and this truly reinforces the sounds and the spellings of these sounds. While the games are optional, I encourage you to NOT skip this part. The student will be learning without even realizing it! The Exploring Sounds section allows you to really work with your student on the new sounds and how the short, long, and broad sounds should be marked when exploring a word and the sounds it makes. 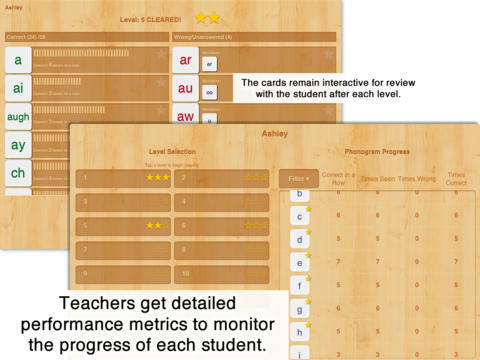 The student workbook has a space for the student to work as you teach each section. The teacher’s manual spells it all out for you. It directs you on what to write on the board, what to say, and what to do! No stress! The Spelling Rules section was one of my favorite sections because there was a corresponding spelling rule for the spelling list that the student is about to attempt. The Spelling Rule cards are numbered and allow the student a “flash card” for reinforcement of learning each rule. The spelling list for each lesson was honestly way below Abbey’s reading level, and in most lessons to date, are a bit below her spelling level. However, the fact that each list is reinforcing the new phonograms and the spelling rules is making it worth the effort to not skip this step. Abbey actually likes that she can spell 95% of these words, and can instead just concentrate on the rules and the parts of speech for each list. The grammar section is where the spelling list is used to teach parts of speech. While some words can be used in more than one way, The Logic of English instructs you to have the child concentrate on only one at a time, so as to eliminate confusion. However, they do offer “Grammar Challenges” that help older students recognize these different parts of speech for the same word. The student is directed to mark each word in their list for the correct parts of speech each week. There are Grammar Rule cards available from The Logic of English, but because we did not receive those in our package, I simply wrote the rules on blank notecards and we studied them in that way. The plurals of each noun in the spelling list is then studied, reinforcing the spelling rules for adding either –s or –es to each word. Optional, additional plural practice sections are provided each week. As the lessons progress, each grammar lesson is becoming more and more challenging which I appreciate. We are just finishing up Lesson 6, and we have studied the correct placement of commas in a series. 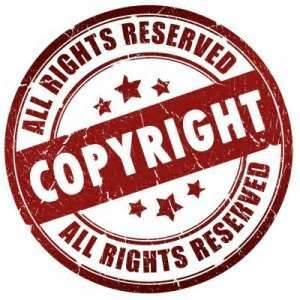 The final section of each lesson includes a dictation exercise where the teacher dictates a series of words or phrases related to the lesson and allows the student to copy them in their workbook. The best part about the dictation? I tell Abbey I am only going to say the word or phrase ONCE, and she has to write what I say. This forces her to listen and concentrate, a much needed skill for my easily distracted child. The vocabulary section challenges your child to learn new words and put them to use. We finish up each lesson with the composition exercise, and as extra motivation for Abbey, she will earn an Icee or an ice cream cone for doing well on this challenging section. She loves that and actually looks forward to this challenge each week. As you can see, this is a very thorough, systematic approach to learning the English language. We have taken our time and broken each lesson into at least two days of work; sometimes even three days. I encourage you not to rush through the lessons. There is so much great information found within, the lessons are written with such care and precision, it is worth it to take each section slowly. There are 40 lessons in The Logic of English Essentials program, so expect to take a full school year to complete this program, according to your school calendar. The Essentials Program is recommended for ages 7 to adult. The lessons are clear and precise and easy to use. Most of all they are fun for the student and easy for the teacher! Want proof that Abbey is enjoying The Logic of English Essentials? Last week, we had to make an unexpected out of town trip, forcing us to forego our schoolwork for the day. Abbey said, “But I’m going to miss doing my English!” True story. Additionally, I found her making a spelling list for her friends to play school with, and at the bottom of the spelling list, she listed the spelling rule for the phonograms in her spelling list. Those are the things that make you know that what you’re doing is really sinking in. I am so grateful that it’s not too late to teach my daughter the correct way to learn our complex English language. Still not sure? 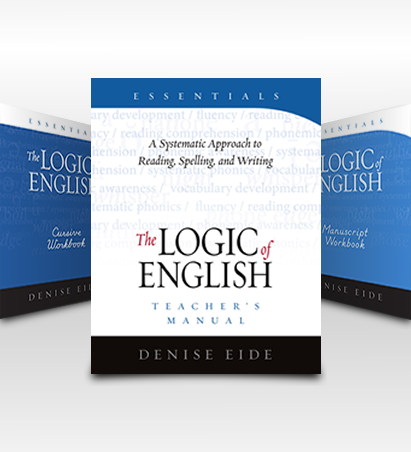 I encourage you to learn more about the wonderful Essentials Program from The Logic of English by clicking HERE for an excellent video overview. My Schoolhouse Review Crewmates also reviewed The Logic of English programs (Foundations, Essentials, and The Rhythm of Handwriting), so please click the banner below to learn more! Scripted is always something that I look for because in subjects that I am not comfortable in I like to have it scripted so I am not afraid of making mistakes! This actually looks really similar to what I use for Spelling and might would be a good fit for my family. Thanks for the review! Thanks for your review. At this point, do you feel your daughter has retained the information she learned? Also, is there any spiral review within the program? Hello, I would say that my daughter has been able to retain a lot of the information. Not all of it, but a lot of it. The mobile app was very helpful in helping to solidify the exercises in her mind. And yes, the program does provide spiral review, as does the app. Thanks April - I'm glad to know this program is not only thorough but also fun/engaging. If I decide to use this program, I might follow up with one workbook of Level 4 from How To Spell (Depending upon how well the kids retain the information). How much time per day and how many days a week would you say that you taught the program? We used it four days per week, about 30 minutes a day, but we were doing every project as directed in the teachers manual. You may find you can skip some of them based on your own students. I love LOE! I reviewed it last year and a couple lessons in I realized it was a bit over my 6 year olds head. So I shelved it and we are using it as our English curriculum for 2nd grade in the Fall. In the couple lessons we did I was amazed how much I was learning! I'm glad you recommend the games. That's something I would usually skip over, but after reading this I think I will be sure to do them. I also decided to not actually plan out how far we get each week. My goal will be a lesson a week but if she needs more time we will go at her pace.